The Break begins with Stella, a woman who witnesses a violent crime from her kitchen window late at night. Through alternating narratives, the author takes the reader through the lives of those connected with the victim, shining a light on both the violence and struggles within Winnipeg’s North End neighborhood. 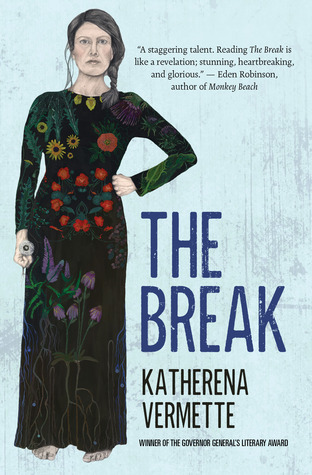 Katherena Vermette’s novel, is in a word, bleak. In saying that, it’s not an attempt to dissuade potential readers, just know that I found it tough to get through. On a positive note, while the subject matter is trying, many of the characters act as beacons of hope for a culture and crises that are often overlooked. As horrific as it is, the crime itself is overshadowed by the circumstances that lead to its creation. It acts as almost a kindling for what the author is conveying to the reader. From the apathetic police department to the fear of interjection on the part of witnesses, a broken system is at the core of the story. Many of the characters, even the perpetrators, exist in shades of grey, something that may not sit right with those looking for justice or simple black and white alignments. Unfortunately, that is often not the world we live in. There are no easy answers and Katherena pulls no punches with the novel’s finale. While The Break is only the second of the five Canada Reads novels I’ve read so far, I would be shocked if this didn’t take the crown at the end of the competition.